USA Today has picked up the various Internet petitions—SignOn, FoodDemocracyNow, CredoAction, etc— to fire Mike Taylor, the head food safety person at the FDA. When the FDA hired Mike Taylor nearly three years ago, I wrote a long post reviewing his complicated employment history: Monsanto, FDA, USDA, Monsanto, private sector, university, FDA—a classic example of the “revolving door.”. He was at FDA, although recused, when the agency approved GM foods and denied labeling. But at USDA, he was a public health hero to food safety advocates. He was responsible for installing food safety oversight systems that have greatly reduced contamination outbreaks from meat and poultry. He was hired at FDA to do the same thing, which is why I thought his appointment made sense at the time. I thought he ought to be given a chance. As I explained to USA Today, I’m a big fan of MoveOn and grass-roots political action, and I’ve been advocating for GM labeling since I was on the FDA Food Advisory Committee in 1994 (if only they had listened to me). But I don’t exactly get where the “fire Monsanto Mike” movement is coming from nearly three years after he was hired. Why make the political so personal? All of the issues mentioned in the petitions are important. All are complicated. All deserve serious thought and attention to political goals. Will firing Mike Taylor advance those goals? In an action highly unusual for the FDA, the agency has released a new “special report” on what it is up against as it tries to get a handle on the safety of imported foods. And imported foods have increased by at least 10% during each of the last seven years and are expected to increase by 15% per year for the next several years. Manufacturers and producers…face intense pressure to lower costs and improve productivity, fueling a cycle in which the quest for efficiency leads to increased production abroad and higher volumes of imported products to regulate. Goods entering the U.S. will come from new and different markets, flowing through long, multistep processes to convert globally-sourced materials into finished goods. The shift in global product flows will make it difficult to identify the “source” of a product and to ensure that all players along the supply chain meet their safety and quality responsibilities. And it is not just legal activity that poses challenges for the FDA. Increasingly, the agency must contend with ever more sophisticated threats of fraud, product adulteration, and even terrorism. 1) Assemble global coalitions of regulators dedicated to building and strengthening the product safety net around the world. 2) With these coalitions, develop a global data information system and network. 3) Expand capabilities in intelligence gathering and use. 4) Allocate agency resources based on risk, leveraging the combined efforts of government, industry, and public- and private-sector third parties. The FDA released its report on practically the same day that the Health and Human Services Inspector General’s office released a report highly critical of the FDA’s ability to monitor the safety of imported foods. Because FDA’s food recall guidance is nonbinding on the industry, FDA cannot compel firms to follow it and therefore FDA cannot ensure the safety of the Nation’s food supply. FDA did not always follow its own procedures to ensure that the recall process operated efficiently and effectively. This kind of criticism is not new. Just last month, the GAO issued a critical report on the FDA’s problems regulating the safety of imported seafood. The FDA’s difficulty with recalls is that until Congress passed the food safety act last year, FDA did not have the authority to order recalls. It had to “pretty please” ask companies to recall unsafe foods. Now it has the authority, but Congress did not grant new resources to carry out that authority. Audits of the F.D.A.’s oversight of the nation’s food system routinely find the agency’s efforts wanting, in part, the agency says, because its budget for such activities has long been inadequate. And although the new food safety law gave the agency extra supervisory powers, it is not clear how much it will be able to do, given that House Republicans have proposed cutting its budget for protective measures. Has a a huge workload. And even though public health officials are working hard, the agency will likely not meet all of its deadlines. On top of the backlog, FDA has no idea what its budget will be for fiscal year 2012. An agriculture appropriations bill that cleared the House last week would cut food safety programs $87 million below fiscal year 2011. The current budget situation does paint a challenging picture…a patchwork of continuing resolutions to keep the government funded — as we saw in 2011 — makes it nearly impossible to plan ahead. When it comes to food safety, we only have one food supply, and it is global. 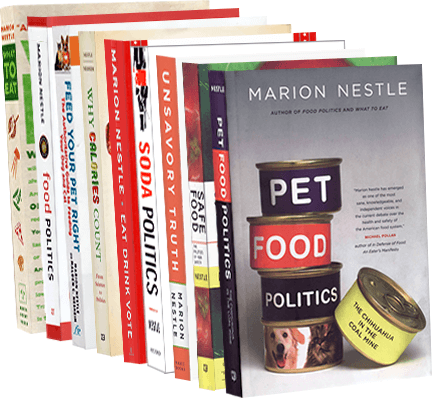 That was the whole point of my book Pet Food Politics: The Chihuahua in the Coal Mine—a case study of how melamine in China got into American, Canadian, and South African pet foods. If it could happen to pet food, it could happen to ours. To monitor the safety of imported foods, the FDA neeeds to be stronger, not weaker. Michael Taylor, the FDA’s Deputy Commissioner for Foods, gave a talk in London yesterday at a meeting of the Global Food Safety Initiative (GSFI). GSFI, for the policy wonks among you, is a project of the Paris-based Consumer Goods Forum (formerly CIES), which brings together CEO-level food industry executives to discuss topics of mutual interest—a World Economic Forum for food companies, as it were. I’ve given several talks at these meetings over the years, presumably because the organizers like to stir up some controversy once in a while. For those of you who live and work in the European Union countries, imported food is a fact of daily life. And many emerging economies recognize that food exports can help drive their economic growth. It is for these reasons – high public expectations and expanding trade in food – that the effort to improve food safety and to build prevention in from farm to table is a global movement…and is good business. It is a global movement that, very importantly, recognizes that the primary responsibility for prevention rests with business – with those who produce, process, import, and market food. Consumers certainly have a role to play as food handlers and preparers. And, of course, government plays a vital role in providing scientific leadership, setting standards for effective prevention of food safety problems, and ensuring through inspection and other means that those standards are understood and met. But everything we do to improve food safety rests on the foundation of the food industry fulfilling its duty to do everything it reasonably can to make food safe. FoodSafetyNews has more details on what the meeting was about. Taylor’s speech is a sign that the FDA is on the job. Cookie dough: Nestlé reports that it has again found E. coli O157:H7 in its cookie dough and will now be heating the flour before using (see, the New York Times account, and the report from FoodProductionDaily.com. This is odd. How do they know that the flour is the carrier? As I discussed in previous posts, the source of the contaminating bacteria has either not been found or not announced. This action implies that the company must think the flour is at fault. Let’s hope so. We certainly don’t want the chocolate bits to be the carrier. FDA news: The FDA announced yesterday that it has appointed Michael Taylor as Deputy Commissioner for Foods. This is a new office at FDA which, if Congress ever gets around to passing it, will be responsible for implementing the preventive control provisions of the food safety bill. Peventive control, I’ve just learned, is the new euphemism for HACCP (Hazard Analysis and Critical Control Point). As I describe in a previous post, Mr. Taylor’s appointment is not without controversy but his expertise in food safety runs deep. I think this is a good move for FDA. Update January 15: And here is what the Washington Post and the New York Times have to say about Taylor’s appointment. I’m quoted in the Post story. He is the quintessential revolving door,” said Marion Nestle, a professor of nutrition, food studies and public health at New York University. Taylor’s support for BGH and Monsanto’s other genetically modified products at the FDA was “questionable,” she said. “On the other hand, when he went to USDA, what he did there was absolutely heroic. He’s been very strong on food safety. Front-of-Package Labels: The FDA is hard at work trying to do something about public understanding of food labels. What with the fuss about the Smart Choices program (now withdrawn), FDA wants to get the front-of-package labeling under control. It is considering various formats for giving a quick overview of the nutritional quality of food products. FDA is asking for public comment on the various formats (see Federal Register notice). I rather like this one, a variation of #1 (colorful, easy to understand, not too cluttered, and makes calories clear). The Nutrition Facts Panel: The FDA also is taking another look at the Nutrition Facts panel on the back of food packages. It is seeking public comment on a plan for consumer research to test understanding of elements on the Nutrition Facts panel. Here’s the Federal Register notice with all the information about what’s going on and where to file comments. What’s interesting about this is that the FDA has great social science researchers on staff. They’ve been kept under wraps the last eight years and apparently are being let loose again. Even so, they don’t get to just go out and do studies like we academics do (with human subjects approval, of course). Oh no. First, they have to announce that they plan to do the studies (which they did some time ago) and get comments on the idea. Then they do the research plan and have to ask for further comments on the research design. That’s what this notice is about. Once they deal with these comments, they can finally get to work. It’s a miracle if they do anything at all. Keep them busy: send comments! Agency Transparency: The Association of Health Care Journalists (ACHJ) and ten other journalism organizations have filed a complaint. The FDA, they say, is still requiring journalists to obtain permission from an agency official in order to conduct interviews with staff members. This is a leftover from the Bush administration. Time to get rid of it. Blogging: It is especially time to open up to reporters because Michael Taylor, who is now senior advisor to the FDA commissioner, is now blogging on the Atlantic Food Channel (which also reprints my posts). If he can blog, FDA staff can talk to reporters. Addendum: Beverages pretending to be dietary supplements: The FDA has just issued guidance to the beverage industry to stop putting herbal supplements into beverages and calling them dietary supplements so they can get around food rules on health claims. If a beverage is consumed as a food, it should be labeled as a food. Guidance, of course, is non-binding but I see this as a warning that the FDA is going to be enforcing its own rules. Good show! On November 13, the FDA announced indefinite postponement of rules requiring raw oysters from the Gulf of Mexico to undergo postharvest processing to destroy their content of Vibrio vulnificus, a particularly nasty “flesh-eating” bacterium. According to accounts in the New York Times and in industry newsletters, the FDA caved under pressure from the oyster industry and members of Congress representing oyster-harvesting regions in the Gulf. The FDA took action on October 16. It wrote a letter to the industry announcing the new rules. It would expect oyster producers to use the techniques, especially on oysters harvested in summer months when bacteria levels are higher. It also issued a background paper on why the techniques are needed, a fact sheet on oyster hazards, and a Q and A on the new policy. On October 17, FDA official Michael Taylor gave a speech to the oyster industry outlining the policy. Oops. The oyster industry did not take well to the idea and went into organized action. Since making its initial announcement, the FDA has heard from Gulf Coast oyster harvesters, state officials, and elected representatives from across the region about the feasibility of implementing post-harvest processing or other equivalent controls by the summer of 2011. These are legitimate concerns. It is clear to the FDA from our discussions to date that there is a need to further examine both the process and timing for large and small oyster harvesters to gain access to processing facilities or equivalent controls in order to address this important public health goal. Therefore, before proceeding, we will conduct an independent study to assess how post-harvest processing or other equivalent controls can be feasibly implemented in the Gulf Coast in the fastest, safest and most economical way. My interpretation: 15 or more preventable deaths a year, every year, from oyster Vibrio must not be enough to elicit industry responsibility or FDA action. That the FDA was forced to back down so quickly is not reassuring about this administration’s commitment to food safety. Make no mistake. This is a major setback to developing a strong food safety system. One of the ironies here is that the FDA’s approach to oyster safety mirrored the approach taken by the very same Michael Taylor when he worked for the USDA in the mid-1990s. Then, the administration backed him up on requiring science-based food safety procedures for meat and poulty producers. This time, it looks like the administration pulled the rug out from under him and forced the FDA to back down. Note: Thanks to Mike Taylor, safety rules are in place for meat and poultry. Unfortunately, the current USDA isn’t enforcing them. I will have more to say on that point in tomorrow’s post. Another note: Center for Science in the Public Interest, which has been pushing for oyster safety for years, has organized a protest campaign. Sign up here. Michael Taylor appointed to FDA: A good choice! On Monday this week, Michael Taylor began his new job as special assistant to the FDA Commissioner for food safety. He will be in charge of implementing whatever food safety laws Congress finally decides to pass. I know that what I am about to say will surprise, if not shock, many of you, but I think he’s an excellent choice for this job. Yes, I know he worked for Monsanto, not only once (indirectly) but twice (directly). And yes, he’s the first person whose name is mentioned when anyone talks about the “revolving door” between the food industry and government. And yes, he signed off on the FDA’s consumer-unfriendly policies on labeling genetically modified foods. But before you decide that I must have drunk the Kool Aid on this one, hear me out. He really is a good choice for this job. Why? Because he managed to get USDA to institute HACCP (science-based food safety regulations) for meat and poultry against the full opposition of the meat industry — a truly heroic accomplishment. His position on food safety has been strong and consistent for years. He favors a single food agency, HACCP for all foods, and accountability and enforcement. We need this for FDA-regulated foods (we also need enforcement for USDA-regulated foods, but he won’t be able to touch that unless Congress says so). So he’s the person most likely to be able to get decent regulations in place and get them enforced. I say this in full knowledge of his history. In the 1990s, Mr. Taylor held positions in both FDA and USDA and his career in these agencies is complicated. As I explained in my 2003 book, Safe Food (see the endnotes for full documentation), Mr. Taylor began his career as a lawyer with the FDA. When he left the FDA, he went to work for King & Spalding, a law firm that represented Monsanto, the company that developed genetically engineered bovine growth hormone (BGH), corn, and soybeans. He revolved back to the FDA in 1991 as deputy commissioner for policy, and he held that position during the time the agency approved Monsanto’s BGH. At the time of the review, he had been with FDA for more than two years. This made him exempt from newly passed conflict-of-interest guidelines that applied only to the first year of federal employment. He also was a coauthor of the FDA’s 1992 policy statement on genetically engineered plant foods, and he signed the Federal Register notice stating that milk from cows treated with BGH did not have to be labeled as such. For whatever it is worth, a 1999 lawsuit and GAO report revealed considerable disagreement about these decisions within FDA. These also revealed that Mr. Taylor had recused himself from matters related to Monsanto’s BGH and had “never sought to influence the thrust or content” of the agency’s policies on Monsanto’s products. I can’t tell whether there were ethical breaches here or not, but there is little question that his work at FDA gave the appearance of conflict of interest, if nothing more. But wait! Watch what happened when he moved to USDA in 1994 as head of its Food Safety and Inspection Service (FSIS). Just six weeks after taking the job, Mr. Taylor gave his first public speech to an annual convention of the American Meat Institute. There, he announced that USDA would now be driven by public health goals as much or more than by productivity concerns. The USDA would soon require science-based HACCP systems in every meat and poultry plant, would be testing raw ground beef, and would require contaminated meat to be destroyed or reprocessed. And because E. coli O157.H7 is infectious at very low doses, the USDA would consider any level of contamination of ground beef with these bacteria to be unsafe, adulterated, and subject to enforcement action. Whew. This took real courage. The amazing thing is that he actually made this work. Now, HACCP rules apply more to USDA-regulated products than to FDA-regulated products. This new appointment gives Mr. Taylor the chance to bring FDA’s policies in line with USDA’s and even more, to make sure they are monitored and enforced. A single agency accountable for providing consistent and coordinated oversight of food safety, from farm to table. Institution of Pathogen Reduction: HACCP, with performance standards verified by pathogen testing, at every step of food production. Recall authority, access to records, and penalties for lapses in safety procedures. Standards for imported foods equivalent to those for domestic foods. Food safety to take precedence over commercial considerations in trade disputes. Yes, he revolved back to Monsanto after leaving FDA but he didn’t stay long. He left Monsanto for Resources for the Future, a think tank on policy issues. In 2007, he went to academia and joined the food policy think tank (see his bio) at George Washington University. There, he produced the excellent food safety report I mentioned in a previous post, which repeats these points. This is about as good a position on food safety as can be expected of any federal official. I wish him all the luck in the world in getting the safety of FDA-regulated foods under control. For those of you who are still dubious, how about giving him a chance to show what he can do? But do keep the pressure on – hold his feet to the fire – so he knows he has plenty of support for doing the right thing.